On Tuesday morning, I woke up refreshed and feeling the most relaxed I had in ages – I put that down to the massage, sauna and general chilling out the night before. I was raring to go! And to do a bit more exploring. 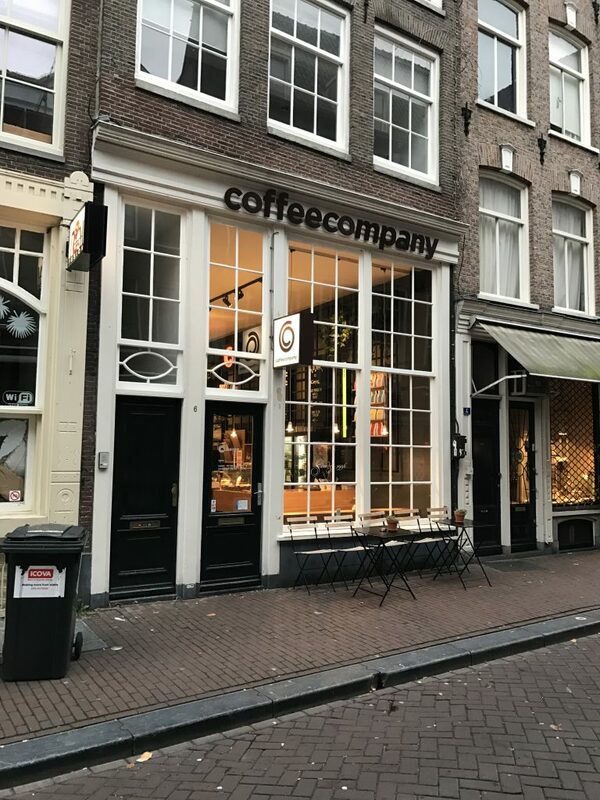 I really, really wanted a Dutch breakfast of ham, cheese and eggs, but decided to save a bit of cash and head back to Coffee Company, which I’d visited in The Hague. There seemed to be loads of them around, so I picked one at random on Berenstraat, and set off on the short ten minute walk. I’ve got to say – even though I was just walking along random streets, the place just looked beautiful. I think the canals make it, but everywhere was just clean, pretty looking, orderly, and traditional looking. Whereas if you take a capital city like London it’s all a bit manic and cluttered and dirty. 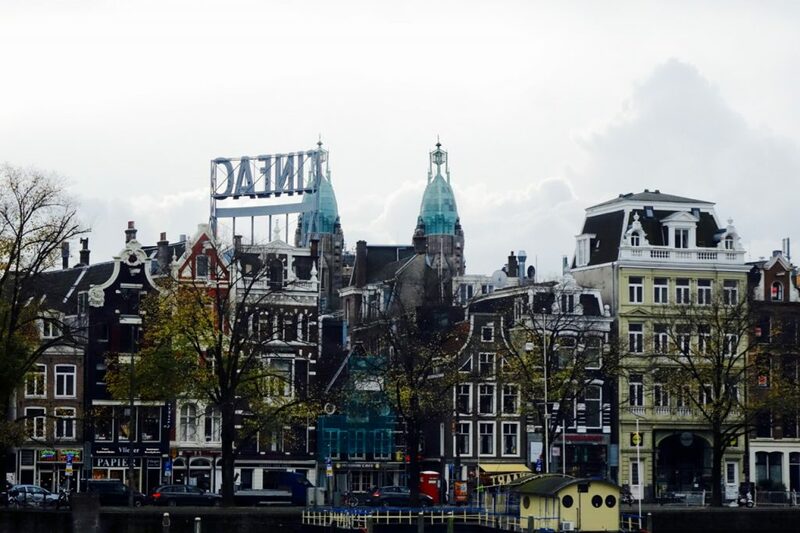 Amsterdam seems more relaxed as well – everyone just seems happy, relaxed and chilled out! It was sunny but bitterly cold. 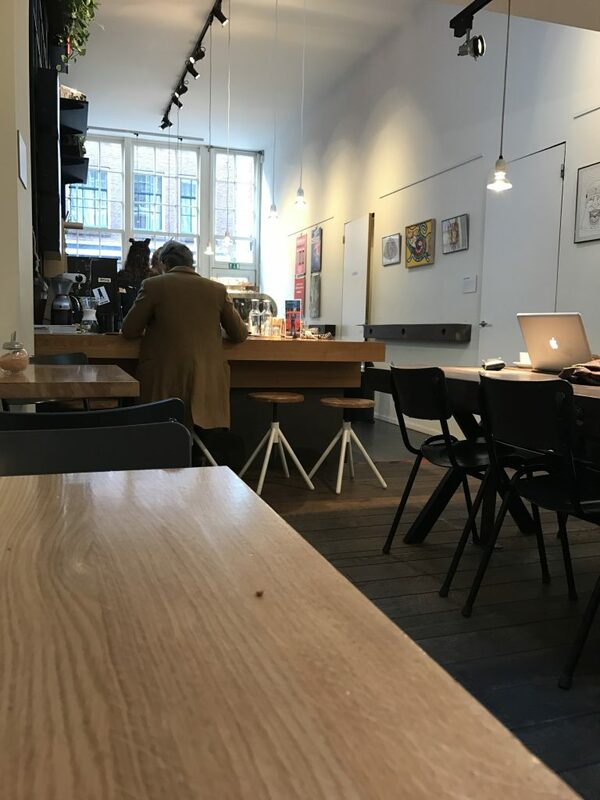 Soon I’d reached my breakfast spot, and settled down with an Americano and – passing on ham and cheese on toast for some reason – a croissant. It was pretty empty as you can see, but it was nice to just chill out on a bit and catch up on Instagram and the news at home. The staff were friendly, and it was just a pleasant relaxing spot. 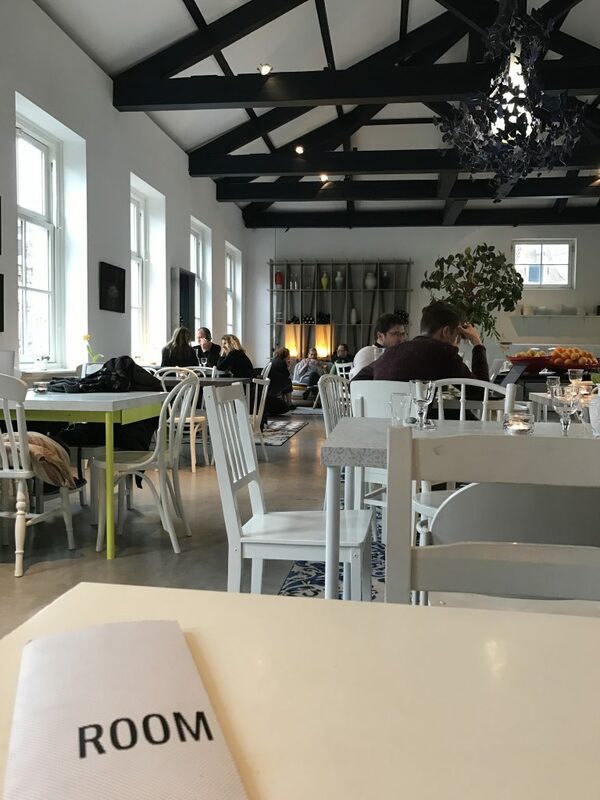 I love cafes like that – perfect way to start the day! 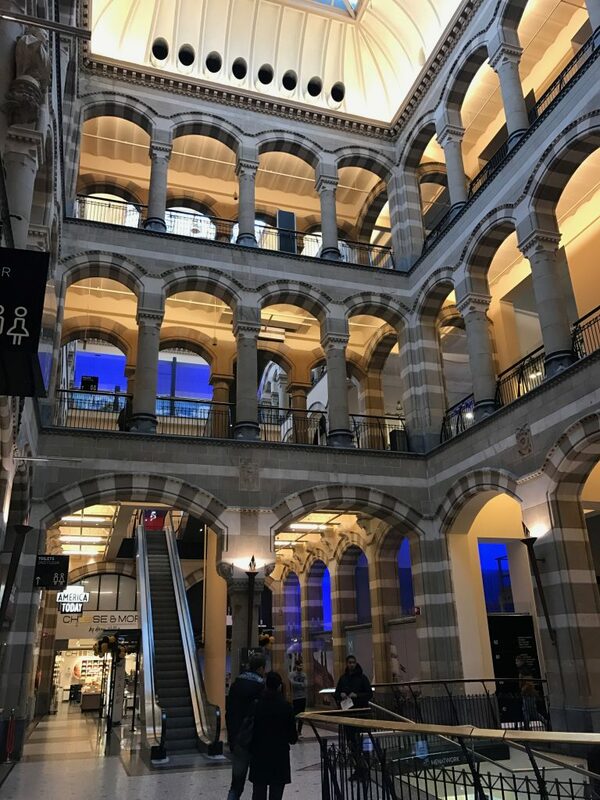 I then trekked back the way I’d come to the one other tourist attraction I wanted to see in Amsterdam after visiting the art gallery the day before. 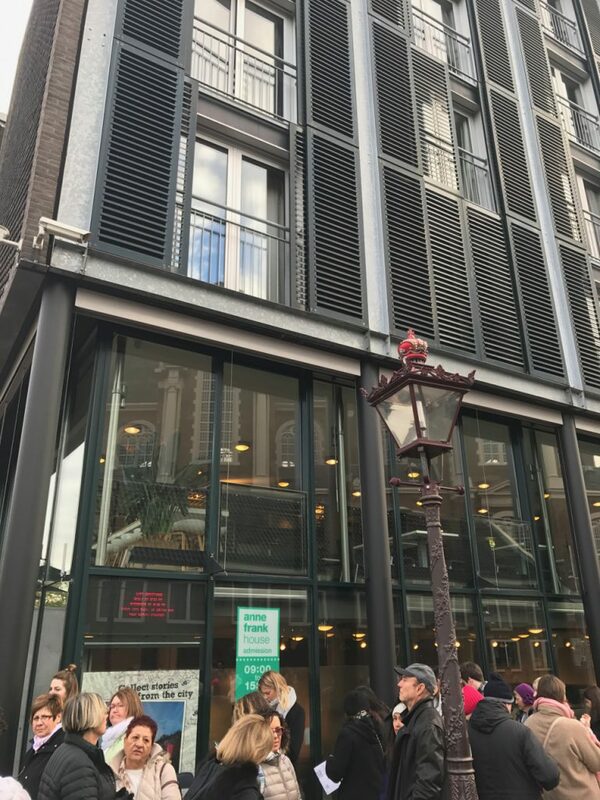 I’d booked my ticket for the Anne Frank House online before I’d left Belfast – as you can only get tickets online if you want to visit before 3.30pm. I’d visited the museum before when I was around twelve or thirteen, but I really couldn’t remember it, and wanted to visit it again as someone older (and perhaps wiser). 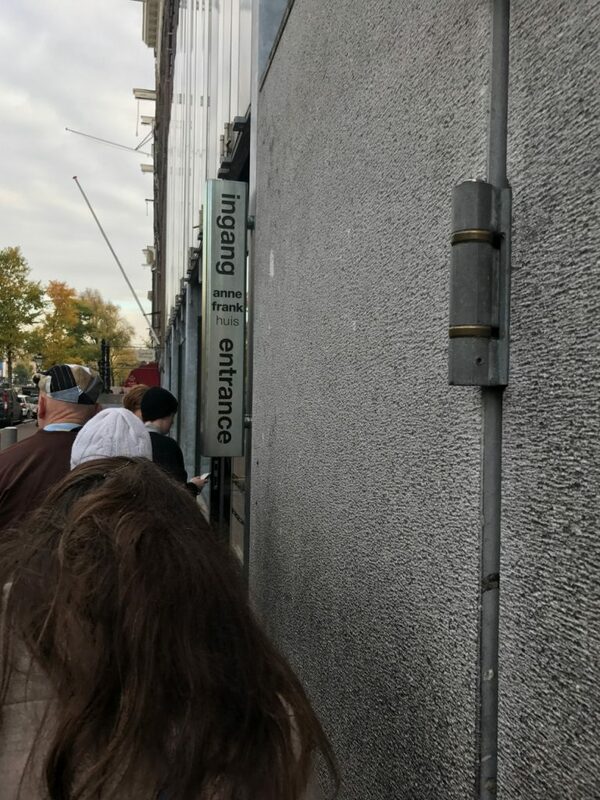 I arrived about five minutes before my allocated entrance time of 10am, and there was quite a queue there already – and several people being turned away because they hadn’t bought tickets, so there’s my tip – do buy online if you want to visit before late afternoon! Soon we were heading inside, with people with them having their bags searched. Unfortunately you’re not allowed to take photos inside the museum (and I saw people getting stopped doing that) so I have no photos of the inside. It was nothing like what I vaguely remembered from my previous visit. I think it had been extensively done up, as the entrance was really modern. After watching a short film, I went upstairs in to what was the original building where Anne had hidden. There were photos, displays and bits of information about Anne’s life and what had happened when the family went into hiding on the walls and in display cases. What I did find a bit strange was that when you walked into a room, there were photos on the wall which you thought showed what the room actually looked like during the war. But then when you read a description underneath it said the photo was actually a reconstruction of what the room would have looked like. So that was a bit weird. Browsing through a book in my hotel room by the artist who had done the hand-drawn map on my room’s wall, I read he kind of pointed out that you were never really sure in the museum if what you were seeing was real, or as it had been or not. Which I think is a pretty good point. You never really knew if the room had been left the way it was or reconstructed – and in that case did it look like what it had actually looked like? What I couldn’t deny though was that walking around, I just felt really, really sad – and depressed – that a family and young children had found themselves in that situation. The atmosphere – combined with reading pages from Anne’s diary was a bit gut-wrenching sometimes, and I’ll admit there were times I felt like I was actually going to cry when I was going round. I guess the other thing you realise is that persecution is still going on in spots around the world, and it made me feel a bit helpless. After I explored the house, there was a film playing in another modern space which showed famous people and also people that had known Anne – classmates and so on – talking about her. I stood and watched that, then filled in an online form on a computer about my thoughts after visiting the Museum. I felt sad Anne will never know that her diaries were published, or the impact they’ve had. I walked back out into the chilly Amsterdam sun. 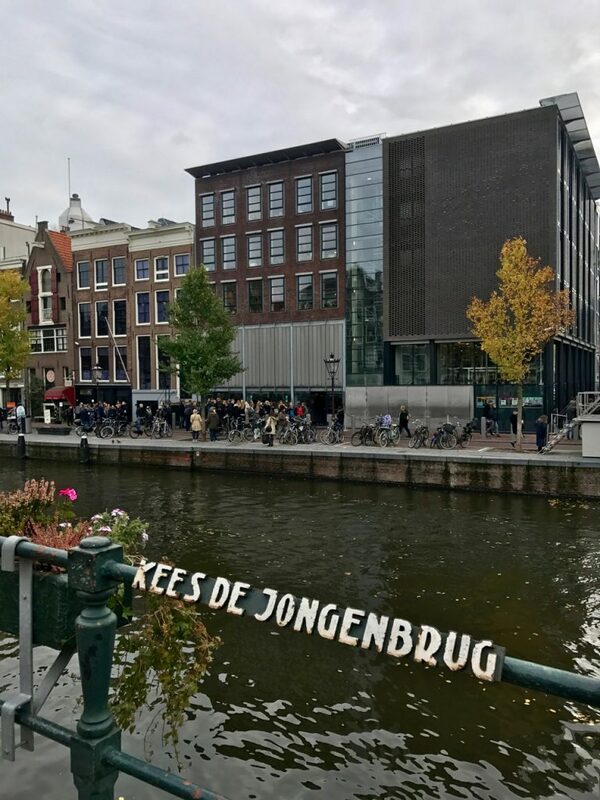 I have a memory of a photo of me and my little sis being taken on the bridge facing the Anne Frank House, so I crossed the bridge and took a photo from where I think I can remember standing. I’ll have to try and find that! As you’re not allowed bags in the museum (though there are lockers), I’d left mine back at the hotel, so I headed back to pick my bag and DSLR up. One mistake I’ve found myself making frequently when I go travelling is making too many plans. I end up rushing around, trying to cram things in and end up not really having any time to relax – I guess it’s the thought of missing out on something. On this trip, I’d deliberately left my afternoon completely clear to stroll around and check out some shops. 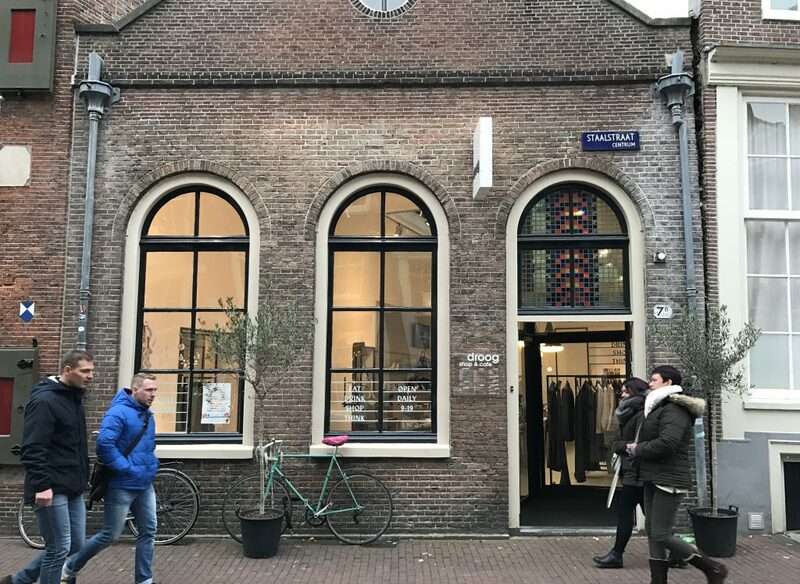 I left the hotel and started heading towards Leidsestraat – where there’s loads of small and not so small clothes shops, stopping to take the occasional photo on the way. En route I stepped into Magna Plaza – an impressive building that used to be an old post office, and is now a shopping mall. I was tempted to try on some shoes and clothes in a shop in the basement, but couldn’t really be bothered, so strolled back outside. 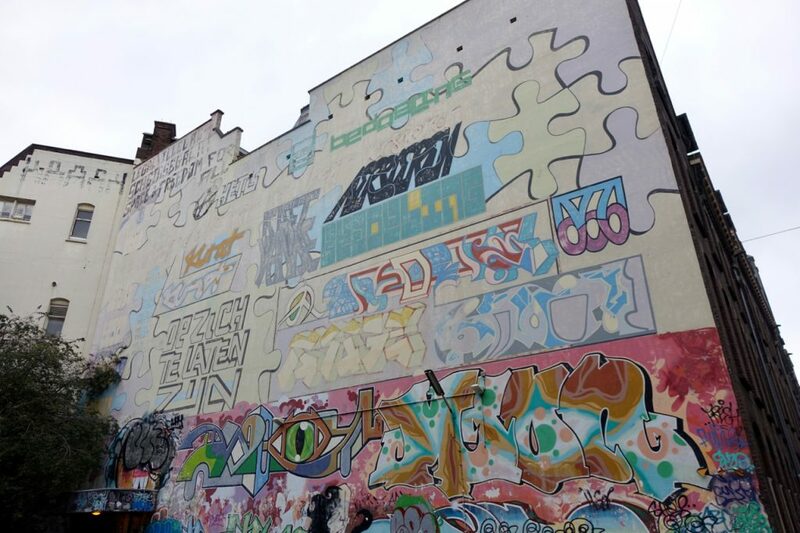 After about twenty minutes I reached Leidsestraat – and just wandered around. I got a shirt from Abercrombie – which I hadn’t been in in ages, and a pair of trousers from Cos which I really liked. 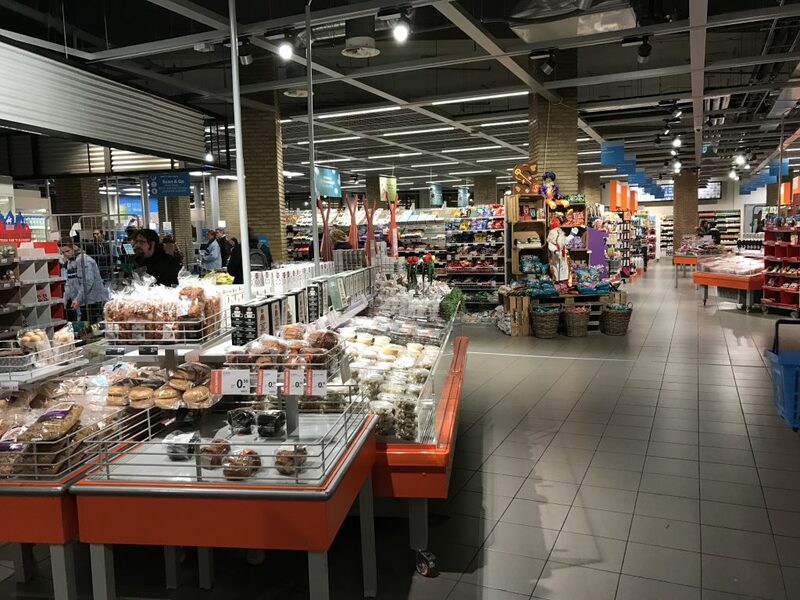 Shopping in Amsterdam is very easy as everyone speaks perfect English, but boy I wish the exchange rate with the Euro had been better for my trip! 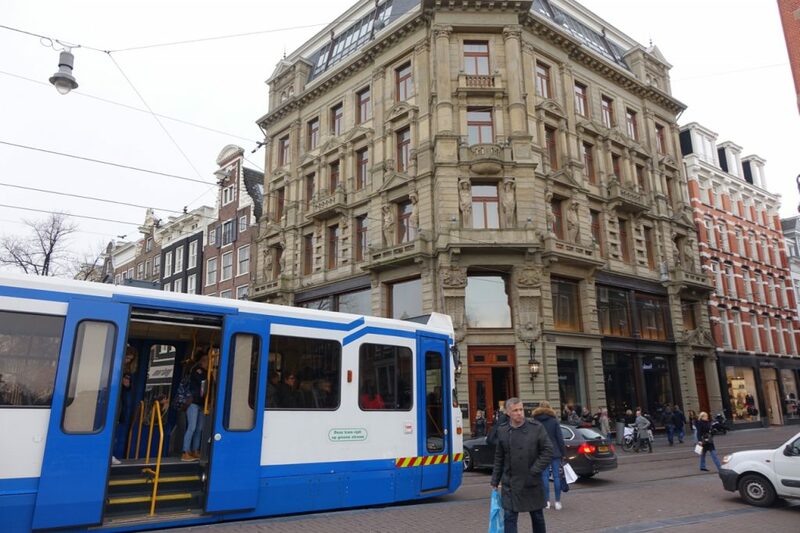 Walking in Amsterdam you really have to keep an eye out for trams and bikes – they’re everywhere! After finishing up on that street, I turned back towards the city centre to see the last shop that had been on my list. 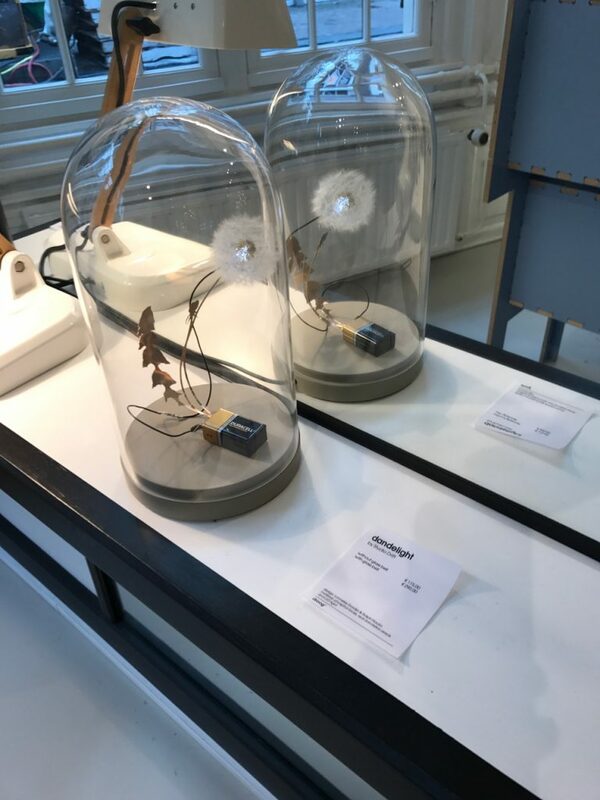 Droog is a design company that not only has a shop that sells homewares and clothes but which also contains cafe and a one bedroom hotel. It didn’t look that big from the outside, but that was deceptive really. The ground floor contained the shop, which was full of the kind of things I’d love to have in my flat (or my house if I ever get round to buying one). Some things were extremely pricey – but there was also some stuff with a more modest price tag. I made a note and took photos of things I liked – like the above light – just in case I do ever have room for stuff like that. You can check out the company’s online store to see some of the other cool items they sell. By now I was getting pretty hungry, so headed upstairs to the cafe. It was light, bright and airy. The entire menu sounded delicious. And they had rhubarb lemonade! Rhubarb is my absolute favourite food in the world, so trying that was a complete no-brainer. 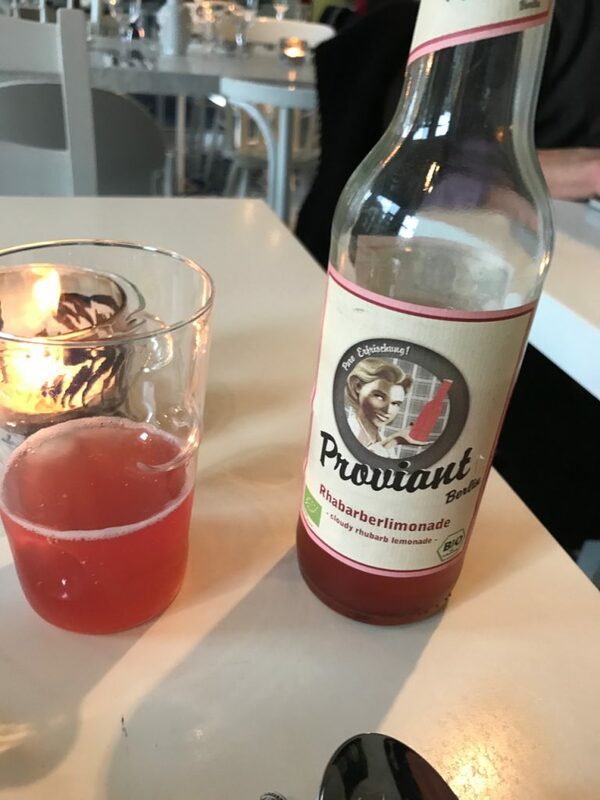 I ordered a bottle straight away – I’ve got to find out how I can get some at home! 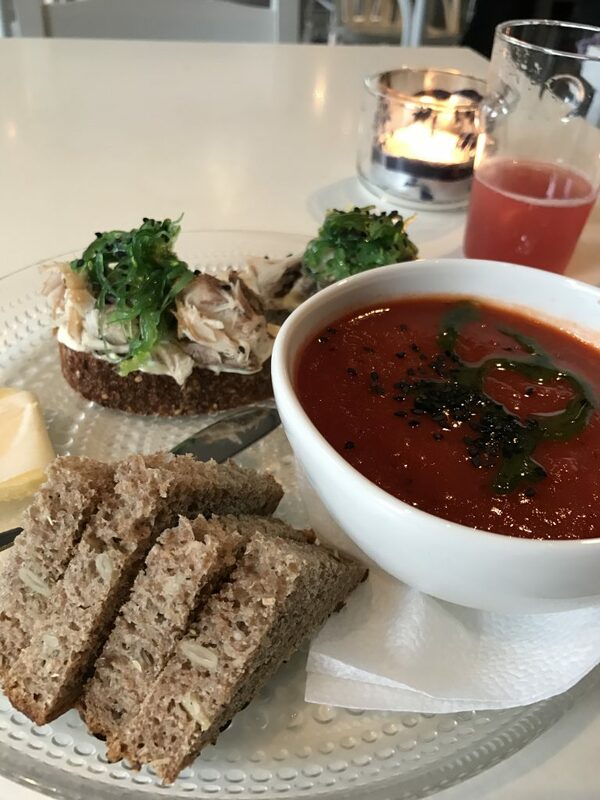 For lunch I ordered grilled paprika and tomato soup, and a mackerel and seaweed salad open sandwich. Rhubarb, paprika and mackerel – it doesn’t get much better than that for me! It was delicious – the soup was smoky, and really warming – hitting the spot perfectly. The sandwich was light and bright tasting. After I’d polished all that off I sat and wrote my postcards, which I’d picked up at a small shop across a bridge from Droog. 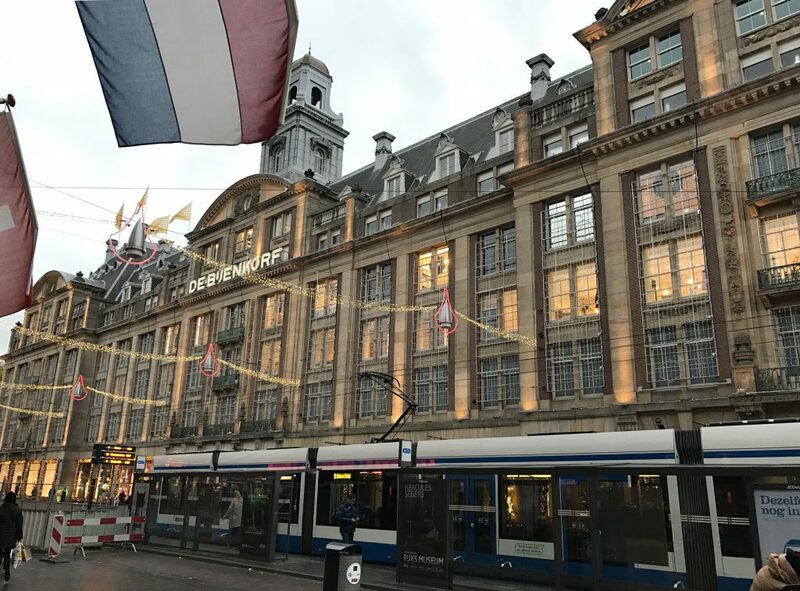 Then using trusty Google Maps, I found a post office and once I’d sent my cards on their way I decided to have a stroll around de Bijenkorf – Amsterdam’s largest department store. I was hoping to get some inspiration for Christmas presents – and hopefully pick up some Christmas cards too that were a little bit different. By now I was feeling a bit knackered from walking around so much, so headed back to the hotel and chilled out for a while. Then I found myself with a bit of time on my hands, and nothing to do – the down side of not really planning to do too much I guess! I decided to head out and explore what lay behind Amsterdam’s Central railway station. After walking for ages the answer I discovered – the way I’d walked anyway – was not that much. 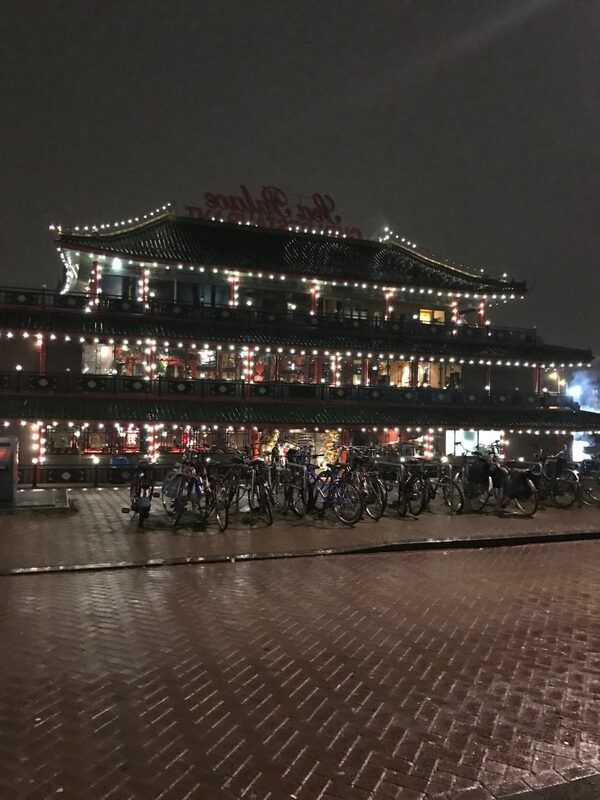 A Starbucks and an electronics store which I strolled around – and a floating Chinese restaurant. Walking a bit further along I came across a massive modern looking library, and a building with loads of excited people standing outside, which I later discovered was a music conservatory. By now I was wet and very cold, so I decided to cut my losses – and once more thinking of money – headed back to pick up dinner from a supermarket. That’s what it looked like inside just in case you were wondering! 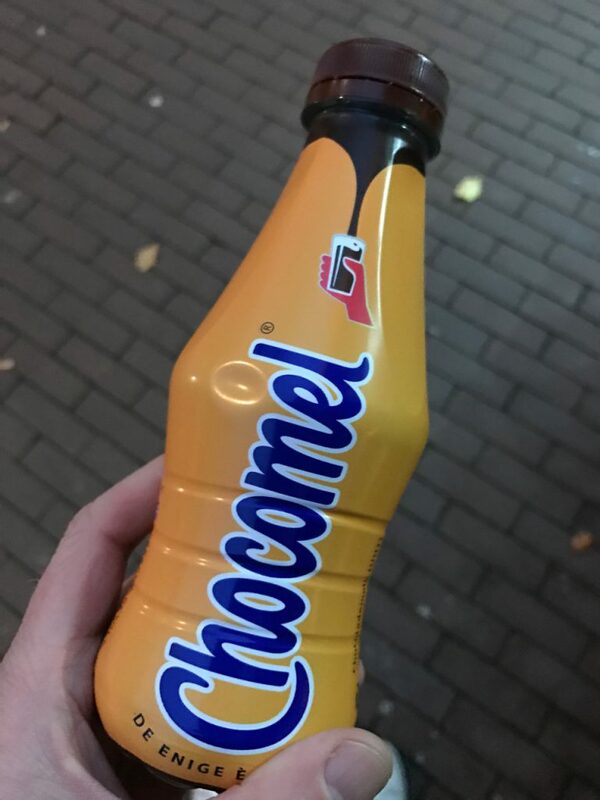 🙂 As well as dinner I also picked up some chocolate powder to make chocolate milk at home – I honestly think the Dutch have it cracked when it comes to chocolate milk. It’s nothing like what we get here, and I can’t seem to get enough of it! I headed back to the hotel, and that was me for the night – I’d had a pleasant enough day, but wished I’d planned my afternoon a bit better – I felt like I’d kind of wasted it a bit just wandering slightly aimlessly. Lesson learnt I think for my next trip – I should plan, and if I can’t be bothered doing something at least I can ditch it and chill out instead! 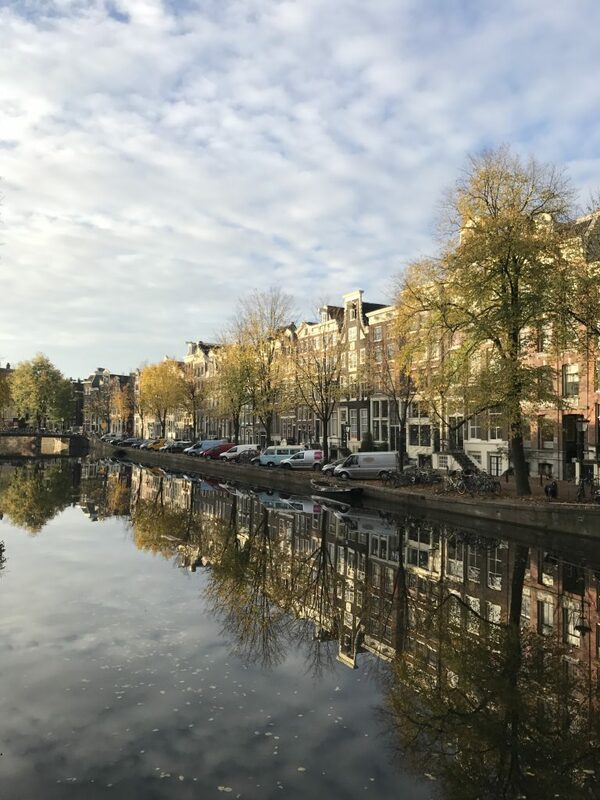 The next morning I was up early, packed up my bag, then said a reluctant goodbye to the hotel – I’d definitely recommend staying there if you’re planning a trip to Amsterdam. Then it was time for just one last bottle…. God I miss you Chocomel! 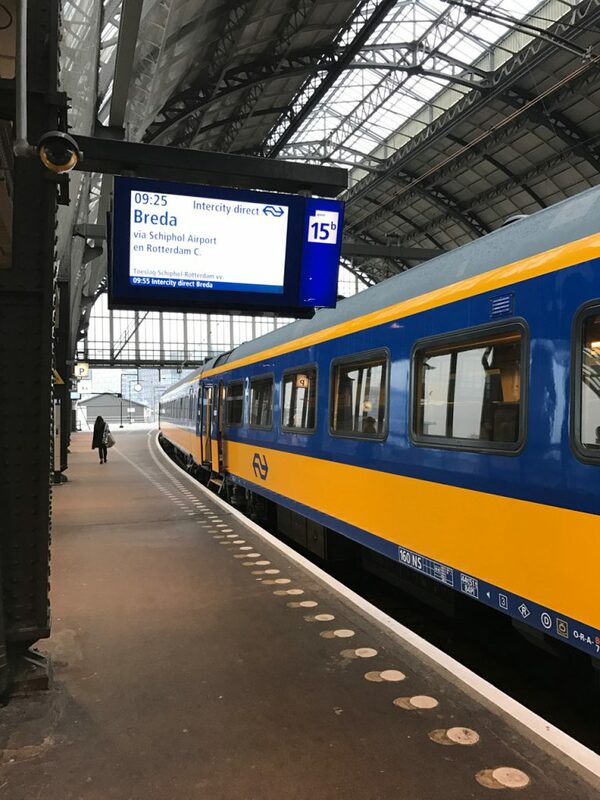 I lugged my bag up to the train station (the cobbled pavements not perfect for suitcases on wheels) and caught the train to Schiphol. My fourth and last trip of 2016 had come to an end. I think I’ve had a good run of travelling this year – Iceland was definitely the highlight, but Barcelona, the Netherlands and a trip to San Diego in the summer were all pretty great too. I just can’t wait to head off again. Now I’m just trying to work out when I can take the last of my leave which I have to use before the end of March 2017. Next on my list I reckon is Berlin, so if anyone has any tips please leave a comment and let me know!